Sugar to taste but only if you need this! Do let a film form on top of the chili then stir before the bottom of the pot burns! 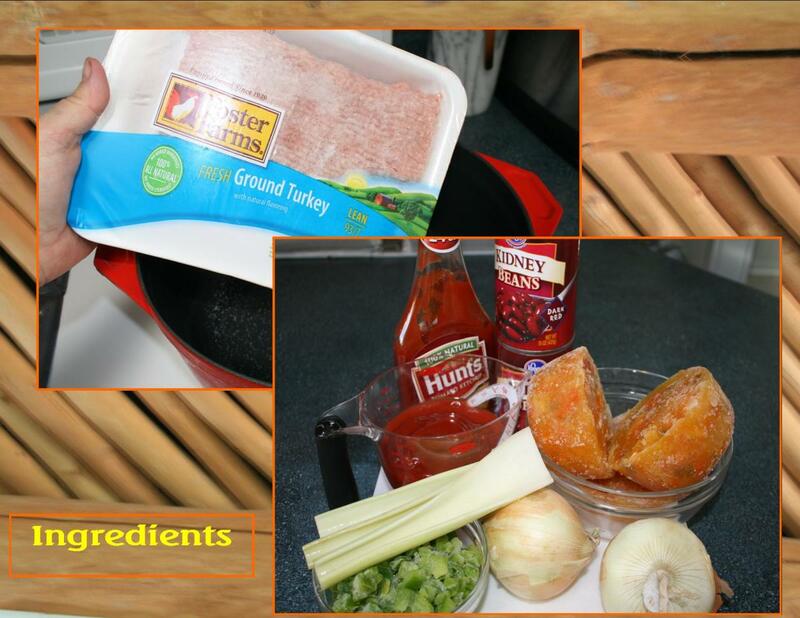 It is best if cooled and stored in the refrigerator overnight and served the next day. You will get raves for this dish! As it makes a lot, do freeze some of it and bring it out in a month. 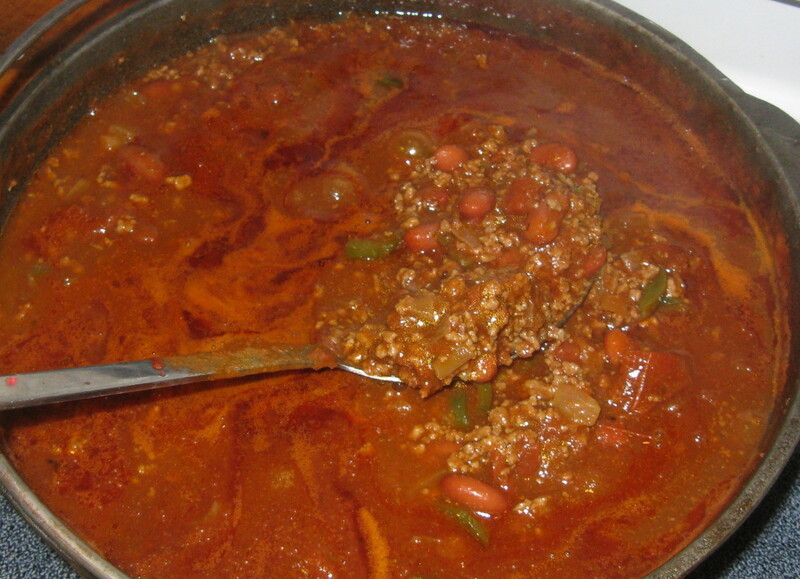 Or if you are feeding a true hungry and cold mob, serve this over spaghetti with cheese and onions and call it Chili YOUR Way! I also serve this with those crunchy oyster style crackers! Add a cheese and vegetable relish plate and you have a full meal! 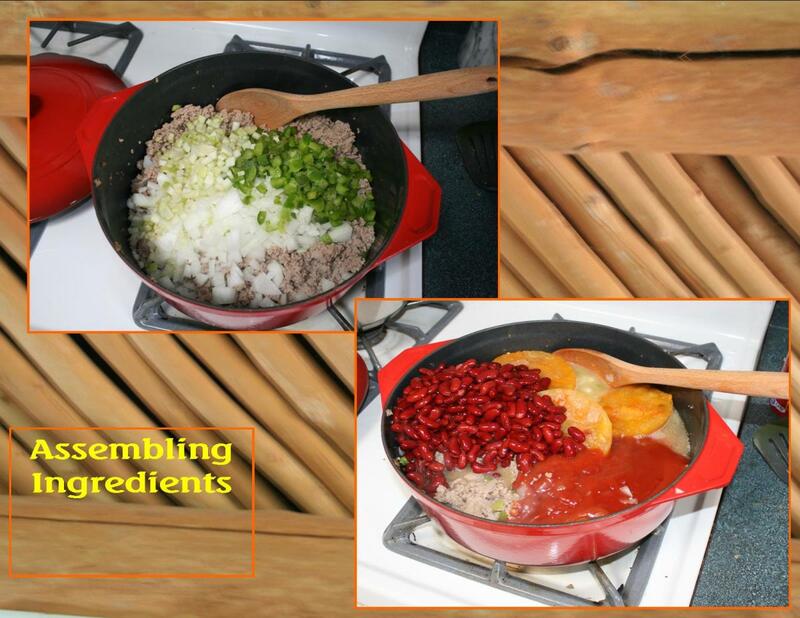 First, here is an alert for all of you looking for a New Mexico recipe of chilé, as this is not New Mexico Chile. This is NOT that chilé, this is a Midwesterner recipe. In fact, it is most unfortunate that the New Mexico Chilé and the Midwestern Chili soup shares the same name for two very different foods. The first time I ordered and received a bowl of New Mexico Chilé I was surprised. In the Midwest the New Mexico version is a stew not a bowl of chili! Both are wonderful but very different! So, open your mind to a Midwestern Chili. If you make correctly it will become a family favorite. There are links below to the New Mexico chilé, however. 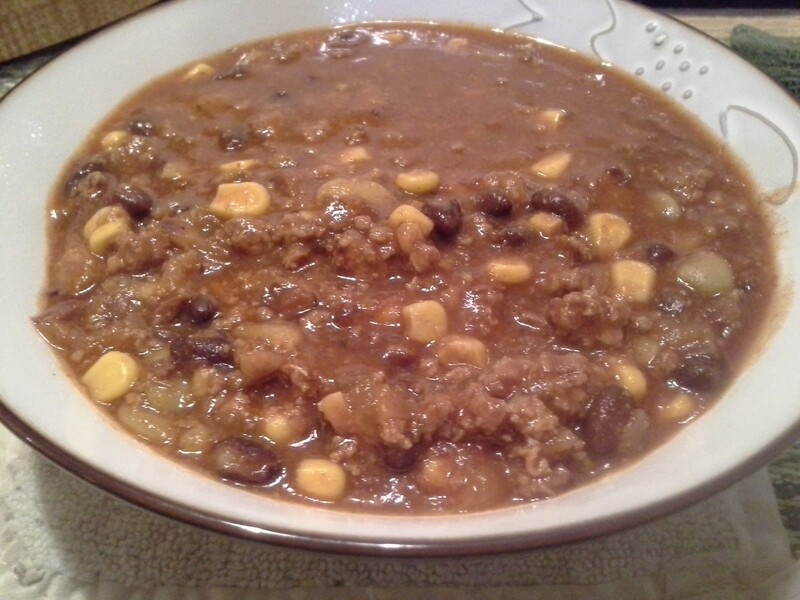 Chili Midwestern is a delicious warm fall and winter bowl of nourishment. Besides Our Family Little Bowl of Heaven Chili there are some very good chili or chile soups served at Steak'n'Shake and O.T. Hodges Chile Parlor. Both are in the Midwest. One says the soup is chile and one says the soup is chili. So, yes it is confusing! 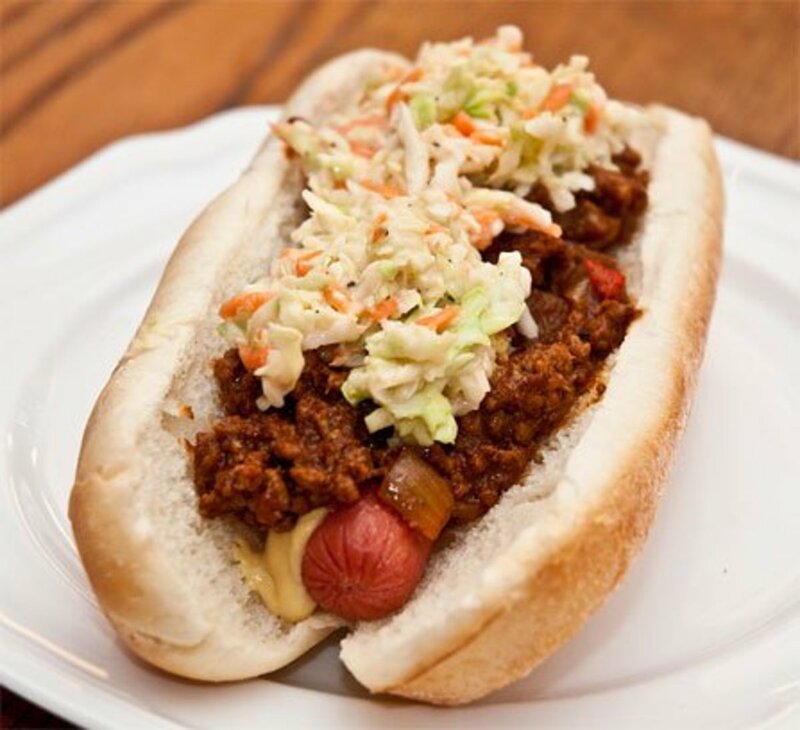 There are two very famous and very delicious chilis from the Midwest. O.T. 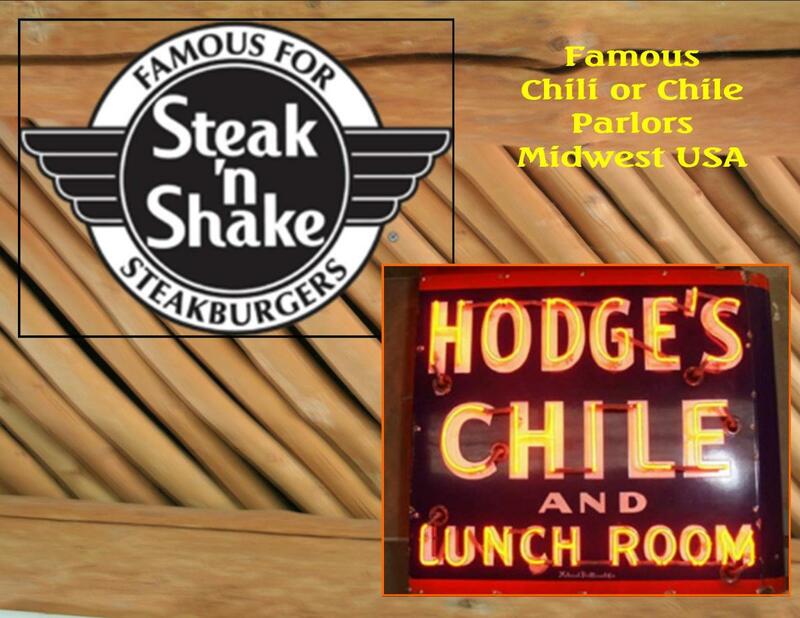 Hodges Chile Parlor began selling their chile at the St. Louis Worlds Fair in 1904. The demand and love of the chile made O.T. Chile Parlors a tradition in both St. Louis and Chicago. The O.T. Hodges Chile Parlor that I remember when I lived in St. Louis had impressed tin ceilings, little white and black tiles on the floor, and a smell to relish when you walked in! They expanded to a location in a downtown mall too. Well, their chile is delicious. Yes, they do chile with an e! The Steak'n'Shake Diner was founded in 1934 in Normal, Illinois. Yes, yes those of us from the state of Illinois have heard all the “Normal” jokes. Gus Belt, the founder specialized in premium steak burgers and rich thick delicious hand dipped premium ice cream milk shakes. To prove his point he often brought steaks (round, sirloin, and T-Bones) and ground them for his famous Steak Burgers. His chili soup was a great favorite. When I was a kid my favorite place to go was the Steak'n'Shake for their Chili. Steak'n'Shake serves chili several ways. Chili is a nice bowl of chili with oyster crackers. Chili 3-Ways is served with extra chili beef, their special sauce all on a bed of spaghetti. Chili 5-Ways is also served on a bed of spaghetti with extra beef, special sauce, diced onions, shredded Cheddar and jack cheeses. I don't live within 2,000 miles of Steak'n'Shake. Once, when we were on an RV trip across the southern part of the USA I saw a billboard on I-10 stating there was a Steak'N'Shake many miles ahead in Pensacola Florida. I made my husband wait (and nearly starve to death according to him) so we could eat there. However, I am equally in love with the Steak'n'Stake Patty Melts. A patty melt is a hamburger melted to the bread by cheeses. In New Mexico you are likely to get one with green chilé on it, which is wrong but still good! But that is another story! In order to get my chili soup I had to come up with my own chili soup Midwestern. This is it and it is based on my Mom's Chili! 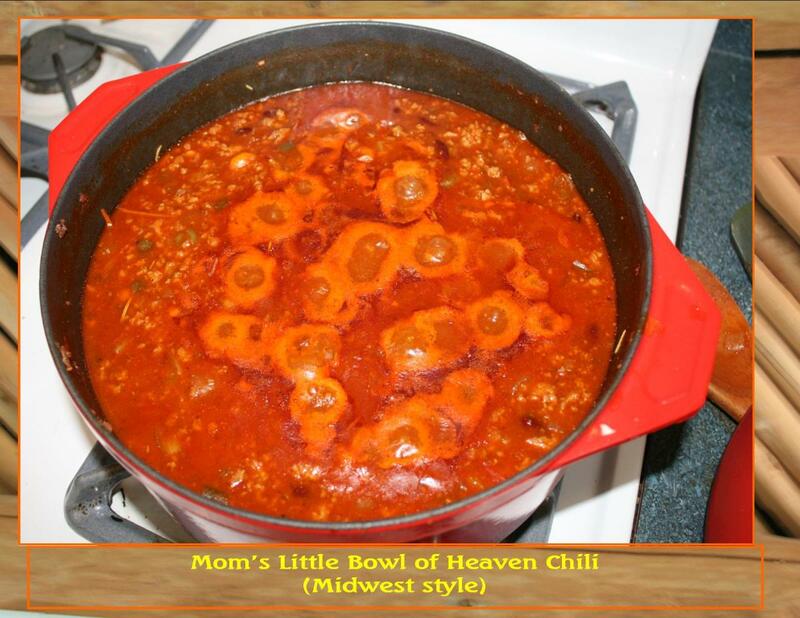 Every generation changes up something, so it is 'Our' recipe and here is the recipe for Our Little Bowl of Heaven Chili ala Midwestern! 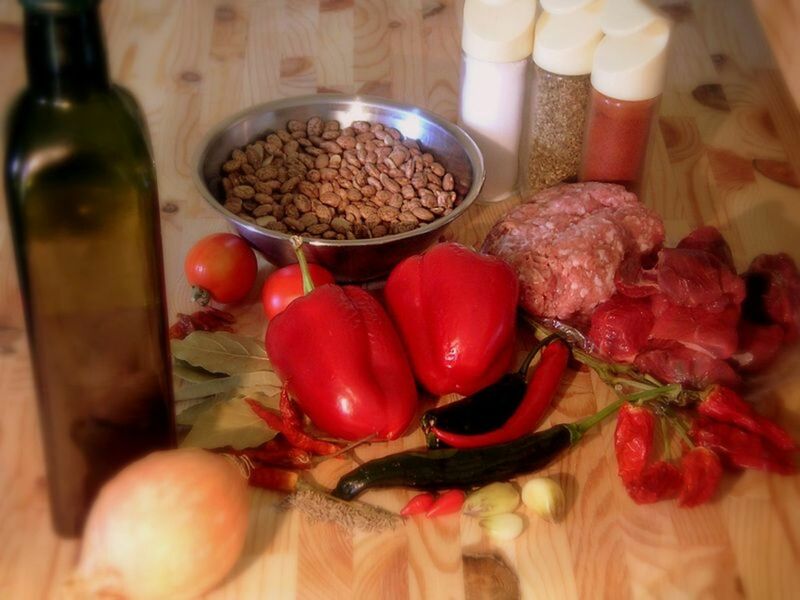 Greek Pasta. Mizithra Cheese Pasta Compare to Olde Spaghetti Factory burnt butter Mizithra Cheese Pasta dish but healthier! Vegetarian too. Salsas and Nachos New Mexican How To! Weekend foods New Mexico style. Nachos. tomato salsa, tomatillo salsa, avocado dip, green chile cheese fries, jalapeno peanut brittle, wines, beers, and sodas Tailgate ideas. Recipes for preserving tomatoes. Freezing tomatoes for basic stews and with an Italian twist. Kind comments esp. since they come from good writers! Yummy! 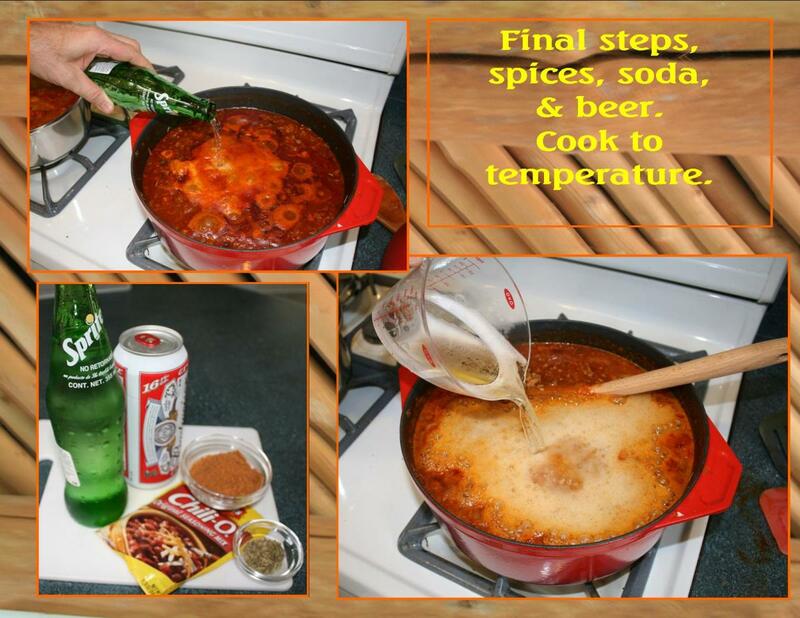 This is perfect weather here in Michigan for chili so I will have to give your recipe a try when we eat it next. I've had Steak and Shake burgers but never their chili, guess I'll have to give a try next time! Thanks for the recipe. That looks so good... I would never have thought to add beer... great layout, well written.... and now I am hungry!